John Wignall married Ellen Jane Ritchie at the Register Office, Durham on 31st December 1880, her father George Ritchie was a Labourer. They are not shown on the 1881 census. John died 5 October 1929. 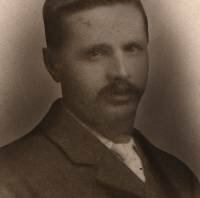 Thomas Wignall married Frances Scouler, born in 1861 in Shoreswood, Northumberland,in Tynemouth on 20 April 1886. Thomas was a boarder in the home of John and Elizabeth Scouler on the 1881 census. Thank you to Mary Keesler (nee Wignall) for this information. They had 5 children, 2 were born in England (Ponteland). William H. born 18th February 1887 and Alice born 19th December 1892. Thomas went to US to work in the mines in Mayfield Pa.
Thomas jr. died. Olive was born 19th November 1905. Thomas died 18th September 1926 in Mayfield but Frances lived to be 93 and died in Mayfield in 1954. William married Ivy Pearl Weller on 20th October 1910. She was born 7th September 1889 in Aristes, Pa. She died 7 August 1943. He died 14th May 1964 in Clarkes Green, Pa.
Sarah Ann Wignall married Robert Harker at Shadforth Parish Church on 24 November 1883. Uncle Will and Esther never married and continued to live in their home near the church in Shotton until they died in the 1970's. 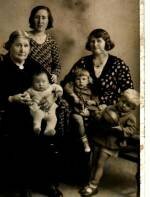 Aunt Sarah and Aunt Olive also lived in Shotton with their families. Elizabeth Wignall married John (Jack) Harker on 30th January 1986 at Shadforth. John and Robert are brothers. Lizzie Harker raised Edna Makepeace when her mother died in 1915. Their are several burials of Harker infants in Shadforth Churchyard, I do not know which sister was their mother. Elizabeth Wignall was also buried in that churchyard on November 1892 - age 57 years. Eliza Wignall married John Allen, a miner from Dinnington, at Shadforth on 14 July 1888. I think this is her photo, Aunt Liza at Wideopen. They had a daughter Ruby who we used to visit in Byker, Newcastle. James Wignall and Elizabeth Ann Gillhespy married at Shadforth on 9th July 1898. James died 19th February 1919. George Wignall married Mary Young 13th April 1895. She was born in 1870 and died in 1902 age 29. Walter Wignall married Lilly and they had a daughter Janet in 1900?. They kept a guest house in Barnard Castle and I spent many happy holidays with them as a child. Janet died in childbirth but her child survived and lived in Barnard Castle with his father and a second wife. They moved to York and Aunt Lilly went to live with them after Uncle Walter died. David Wignall never married. He was cared for in his retirement by my grandmother and died on 16th March 1948. I knew him as "Pete" for some reason.